The 15-inch Lenovo Yoga 720 started turning heads as soon as its specs were released: a quad-core CPU with a Nvidia GTX 1050 in a 14.33 x 9.5 x 0.74-inch package? An aluminum chassis? No stupid colors or gaming design elements? No giant bezels? Convertible? Thunderbolt 3? Is the 15-inch Lenovo Yoga 720 too good to be true? As perhaps one of the first people to receive the 720, I’ve had a couple of days with it and I’d like to share my impressions. I know a lot of people are interested in the Yoga 720 as an alternative to the Dell XPS 15, and that’s just the way I’ve been assessing it for myself. Without further ado, let’s get into my first impressions and benchmarks of the device. 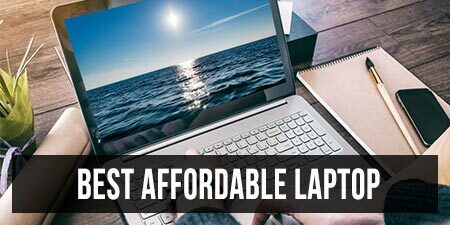 Lenovo also offers a more portable version of this laptop, with a 13-inch screen and Core U hardware, which we reviewed here in case you’re interested in it. 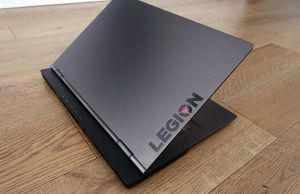 As of 2018, there’s an updated version of this laptop, the Lenovo Yoga 730-15, with 8th gen Core U hardware, GTX 1050 graphics, a smaller 52 Wh battery, as well as a significantly more affordable price. 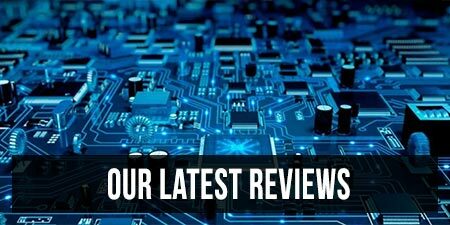 You’ll find all about it from our detailed review. The first impressions you’ll get of the Lenovo Yoga 720 is that it’s a little heavy, and the aluminum finish is very smooth, like worn Onyx. It’s only 4.4lbs according to Lenovo, but—perhaps because you’re expected to flip it around in your hands and use it as a tablet occasionally—it seems a bit more than that. The overall finish is smooth and comfortable in the hand, while the beveled edges around the trackpad and fingerprint are nice accent touches. It feels solidly constructed and not at all fragile (as you would hope a 15-inch convertible that costs north of US$1200 for the base model would be). It is slightly (but noticeably) larger than the XPS 15, yet it also doesn’t feel quite as premium and well put-together. Stacking them on top of each other, you can see the Lenovo is a few millimeters bigger in each dimension. It doesn’t seem to pick up fingerprints anywhere near as much as its contemporary, however. 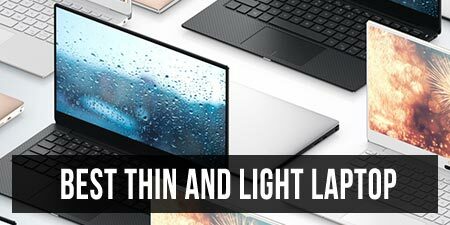 Where the XPS 15’s design is sharp and angular in parts due to its layered aluminum/carbon fiber/aluminum sandwich construction, the Yoga 720 feels distinctly more round and smoother in the hand. Whether this is a plus or not is up to your taste, but for me I preferred the more solid look and feel of the XPS 15. The keyboard is one area where the Yoga 720 is clearly head and shoulders above the XPS 15. The keys are more solid, have no wobble, and travel slightly deeper than the XPS 15’s. I don’t have an exact measurement, but I would guess 1.4-1.5mm compared to the XPS’s 1.3mm. The other clear area of superiority here is the design of the fingerprint scanner. 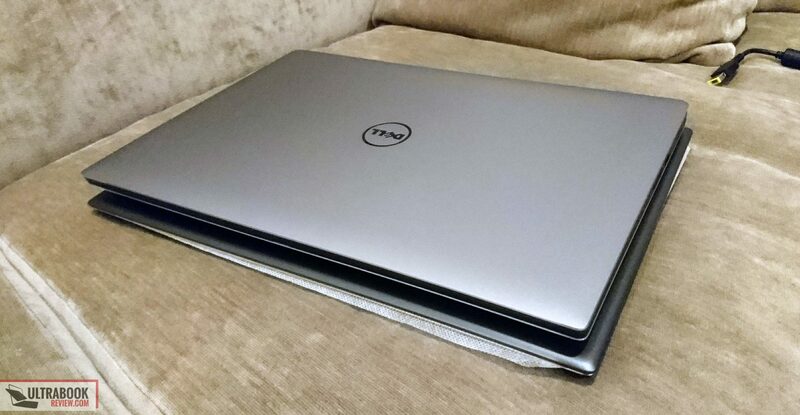 Unlike the XPS’s implementation, this one seems well designed into the chassis and is always easy to see and find with your finger in dim lighting. Some other notes for keyboard aficionados: Lenovo has swapped the Fn and Ctrl keys to a “standard” arrangement (generally these are reversed on Lenovo laptops in comparison to most others). There is a function key toggle setting in the sparse BIOS, but not much else (there is an option to disable the dedicated Nvidia GTX 1050, however). All in all, the keyboard is very much a strong-point of this machine when comparing to the XPS. The touchpad, however, is a different story. Although it uses Microsoft Precision touchpad drivers, it is an all-around bad experience. I’m not sure if my unit was defective, but nearly every other gesture was not recognized, and the cursor would fail to respond frequently (I tried turning off the palm-check to no avail). The touchpad also has a very floaty feeling, making the mouse feel imprecise even when it does function. Hopefully Lenovo will get their act together and fix up the show-stopping experience that is the trackpad. The unit I received had the FHD (1080p) screen. Although there is a 4k option, I feel that the smart money is on the FHD due to the relatively limited 72WHr battery. The XPS 15 gets about 7-8 hours of battery life with a 96WHr battery and the UHD screen, so it’s reasonable to expect the Yoga 720’s battery life will be roughly 25% less. By my calculations, that will give most users between 4-5 hours of battery life with the 4k display—but we should wait and see what the real world numbers end up being. Back to the FHD screen, it is underwhelming. 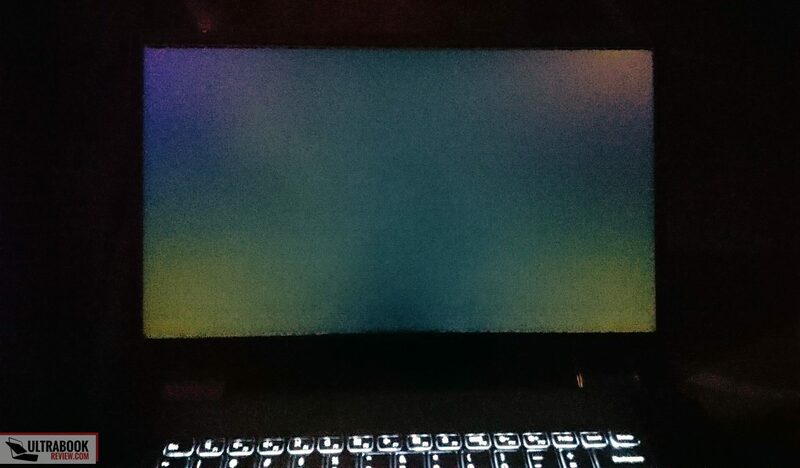 There is a fair amount of backlight bleed, but worse than that, I had a stuck (lit) pixel in the upper left corner. Quality control issues aside, the display seems quite average. It doesn’t get anywhere near as bright as the UHD or FHD screens on my XPS 15s, and has some color wash-out when viewed from off angles. The contrast and color gamut, although not quantified with a colorimeter, are subjectively inferior to both the UHD and FHD displays on the XPS 15. Combined with the glare from the highly reflective Gorilla Glass, it is a definite weak point and contributes to the whole machine feeling less premium as a result. 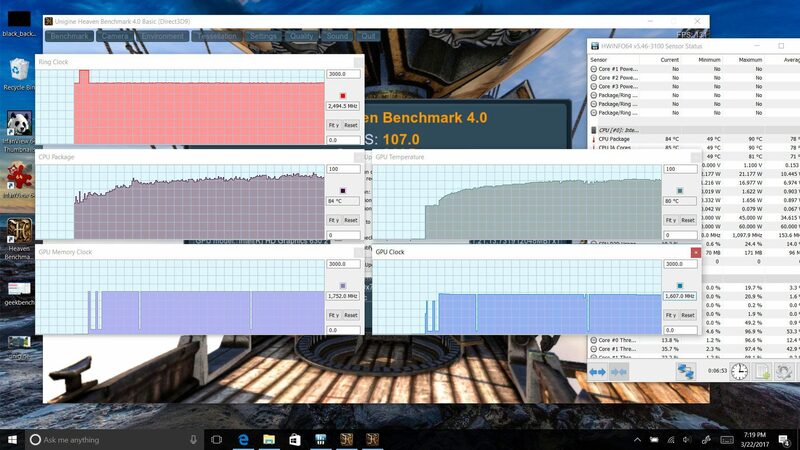 Since some people complain of IPS ghosting on the XPS 15 displays, I also ran some tests with testufo. If you’re sensitive to response times, I can tell you that the Yoga needed a pixel spacing of 42 for the trail of the moving blocks not to touch, while my FHD and UHD XPS 15s needed about 58 and 56, respectively. 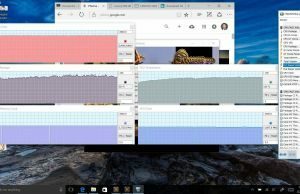 I was able to run enough tests and benchmarks on the Yoga 720 to get an idea of its performance and thermals, as well as determine if there is any throttling of the CPU or GPU. 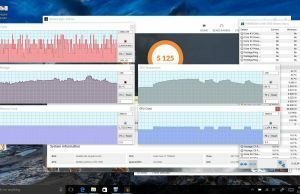 My first test was Geekbench 4.0’s “Compute” benchmark. I set the power plan to “High Performance”, but it seems that the Yoga didn’t feel like going above 3.0GHz for most of the time. As a result, the score was significantly lower than the XPS 15 (which scores around 4600 and 13,500 on single-core and multi-core, respectively). I updated the BIOS and all other available drivers before running the benchmarks, so I’m not sure if this is a bug or an intentional reduction in performance. 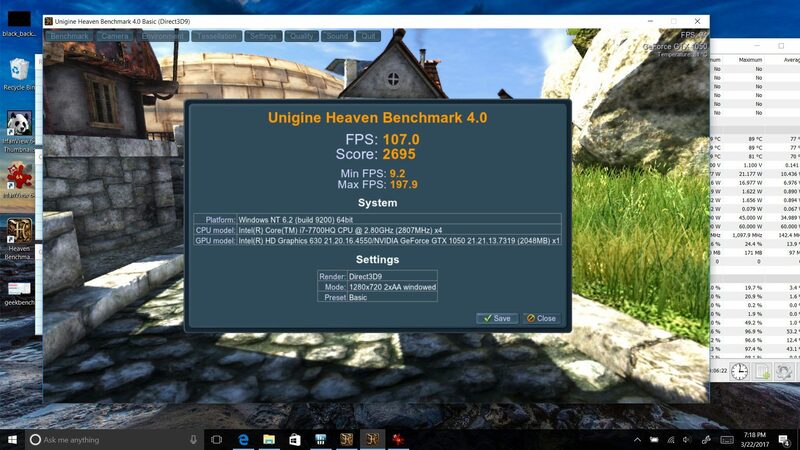 Next, I ran the Unigine Heaven benchmark on “basic” preset, for a solid score of 2695. 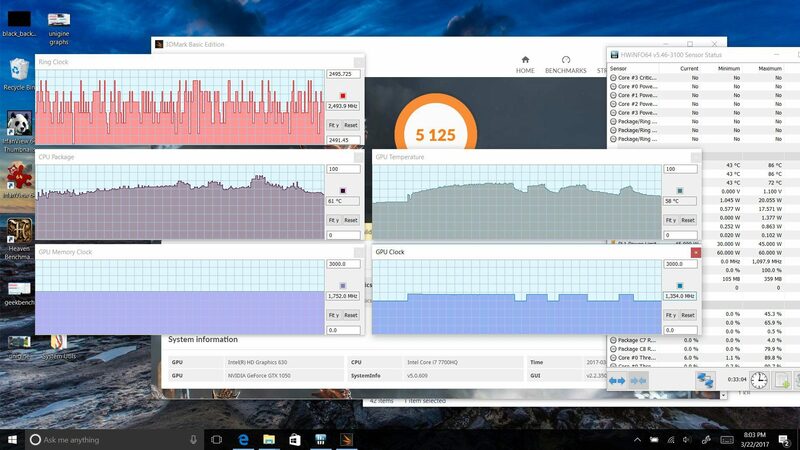 As can be seen in the graphs below, the GPU keeps its clocks very well, despite a toasty temperature above 80C. The CPU, however, still seemed intent on not turbo-boosting much. 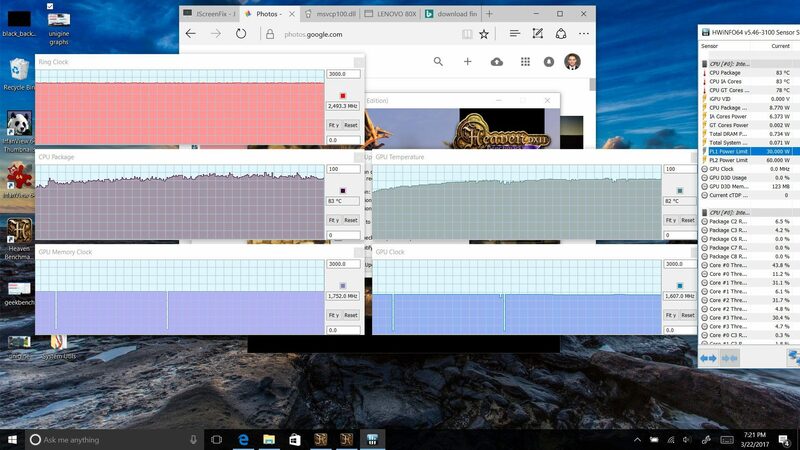 I saw no indications of GPU throttling after running the Unigine Heaven benchmark on a loop for 30 minutes, though both the CPU and GPU got rather hot. These temperatures should be improvable with an undervolt and a repaste, however. 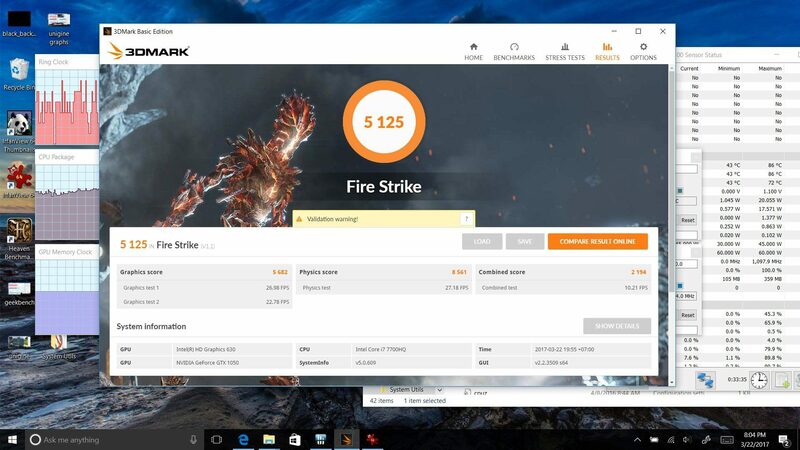 The Yoga 720 did not fare so well on the Fire Strike benchmark when compared to the XPS 9560. Both the CPU and GPU scores are roughly 1000 points below where the XPS typically scores, leading to an overall score about 500 points below the average. 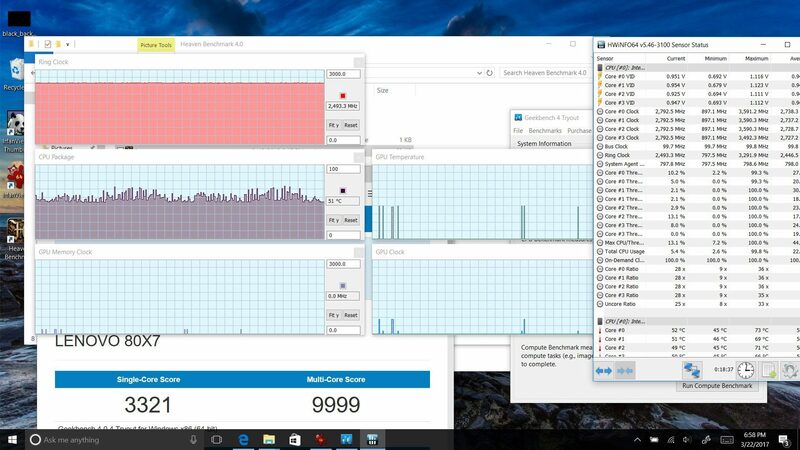 As you can see in the graphs below, the CPU is not operating as fast as it should. The PL1 limit, visible in the window on the right, appears to have been limited to 30W. This indicates some level of VRM throttling on the CPU. I would expect an undervolt to solve this, however, as an undervolted i7-7700HQ will almost never hit 30W even under maximum load. Finally, I took a look at the Thunderbolt 3 port. 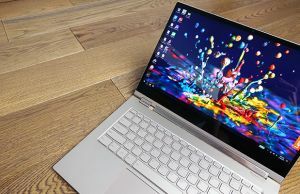 I know a major reason many people are interested in the 15-inch Yoga 720 over the XPS 15 is because the XPS 15’s Thunderbolt 3 port is not connected on all four lanes. Regrettably, it seems that the same is true for the Yoga 720. The Lenovo Yoga 720 is currently “temporarily unavailable”, according to Lenovo’s website. I’m not sure if this is due to the issues I mentioned here, or if it’s just a supply issue. According to previous announcements from Lenovo, it is expected to hit brick and mortar stores in early April for around US$1250 and up. Given the current unavailable status of the Yoga 720, this may be subject to change. I expected a lot from the 15-inch Yoga 720, but I came away a bit disappointed. Defects aside, perhaps I expected too much for a machine significantly cheaper than a similarly configured XPS 15. The build quality I would describe as “good enough”, but is still a notch below the XPS. The screen is something that I could live with as someone who is not working in digital or print imaging, but it may be a deal breaker for others. The two-lane PCIe for the Thunderbolt 3 is a big disappointment, however, and I think that will turn away a lot of people who were looking at it as an alternative to the XPS 15. The floaty and frustrating trackpad was something that also made the machine difficult for me to imagine using as a daily driver: it is something immediately noticeable and consistently jarring for the duration of its use. In conclusion, if you’re looking for a convertible XPS 15-style device, I would recommend holding off on buying this for a few months and see if firmware updates and improved production can solve the issues I experienced. Can the Yoga 720 Charge over USB-C? A little surprised to see absolutely no mention of the Spectre x360 as a comparison, a far more fitting match up than the XPS and likely the machine many will be choosing between, not the XPS. There are many dual-core convertible laptops, but there are very few quad-core thin & light notebooks. Yes, and a real world comparison between a Kaby Lake dual-core 2-in-1, and a throttled Kaby Lake quad-core 2-in-1, would be very useful I think. I appreciate the in-depth review, it's just that not many people have reviewed both and you have. If you were a graphics professional choosing a 15 inch 2-in-1 , would you opt for the Spectre or the 720? In other words, is the performance increase in the 720 enough to warrant compromising on the build quality? I don't have access to a spectre 15 I'm afraid. I think if you are going to do graphics heavily then you'll use the 4k screen and an active stylus or mouse, so the awful trackpad won't bother you. I believe the spectre 15 is all-around a step up in quality from what I've read, but of course significantly weaker in threaded and 3d apps. Depends on what type of graphics I'd do. I do know the 15" Spectre is a dual core device and there will be some form of lag because it is dual core only. Also, HP still has its infamous overheating issues and the 15" Spectre is not exempt from this. The 4K screen would be great for graphics. NotebookCheck covered it in detail. I would honestly take a look around. If I wanted a graphics heavy device, I'd probably go with the XPS15 or find a way to see if I can configure a Precision 5520 with a GTX card as opposed to the Quadro card. FWIW, I returned my HP Spectre x360 (newest version). The 7500u and Nvdia 940 proved to be fairly underpowered for normal multi-tasking (stock quotes in the background with several Chrome tabs running). My 4-year-old old Samsung 7 chronos with an older quad-core, which I need to replace because it is falling apart, runs circles around the x360, benchmarking around 1200-1300 on Novabench vs 900-1075 for the HP. The HP has much faster Wifi though. I thought I would be OK, as the older computer is usually at about 10% CPU during daily use, so I figured the dual core would be about 20%. But it was generally at about 60% running the same programs and seemed like the fans were constantly running. The worst thing, however, and by far the biggest deal breaker was an annoying "Ghost touch" on the screen. Google it. But basically, the screen would suddenly scroll to the top or bottom by itself while web browsing, or would bounce up and down in Word or Outlook. It got worse over a period of a couple of weeks, to a point where I had to return the unit. Luckily, HP customer service is very good and they processed the return easily. If you do not stress it out too much, and are lucky enough to get a unit that doesn't suffer from the Ghost Touch syndrome, then it is a very fun computer. Did you run this in Cinebench 15? If so, how did it perform? Thanks for the early review! It sound really great!! Not worried about display cause Lenovo is known for really good laptop displays, so Im sure that 1 was just bad luck. Also I am not worried about software issues since as you said those will get updated. But the only concern I have is you mentioned the Thunderbolt 3 port, how did you reach to the conclusion of only 2 PCIe lanes? I ask because you acted unsure saying "it seems." How did you confirm the tb3 port was only two lanes like the Dell? That may stop me from getting this. Surprised the trackpad was bad, the yoga 910s is pretty good. Thanks for the prompt and thorough review. I actually have a new yoga 720 that turned out perfect. I repasted it with liquid metal and the temperatures under load are incredibly low. Forgive me, but what do you mean when you say you "repasted it with liquid metal"? How difficult was it to open up the laptop and remove the heatsink? Was it a simple unscrewing process, or did you have to unplug and move some wires around? always unplug battery, but yeah it's just screws. it's a better designed heatsink/cooling solution than the XPS 15 to be sure.
. What are the specs of the yoga you're selling? Hi Douglas, please share a comparison of the gigabyte aero 15 and the Yoga 720, that would be very interseting to look at. So is it benchmarking closer to the XPS after the repaste? How difficult is it to get to the additional memory slot to add an additional 8GB? Also, which SSD do they seem to be typically coming with? SSD is a SK HYNIX PC300 which delivers 1800/400 r/w speeds. Pretty standard OEM NVMe bit. Samsung Pro PM961 (Lenovo OEM) / Interface: PCI Express Gen3 x4. Could you say something about the noise emissons? For me a very important point! It's fairly quiet doing office tasks. Once you use the gpu, both fans come on and you'll hear it. It is quieter than the XPS 15.
i am currently going to college in a few months, and i need a 15" laptop that is capable of doing work and also can run high end games. 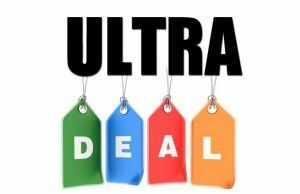 im thinking about buying the yoga 720. im choosing between the hp x360, dell xps, and the yoga 720. which do you recommend? Not the spectre. It is half the speed of the xps and yoga 720 in games. You'll need to mod the xps 15 to play games on it without severe throttling, so I would recommend the 720. Good review. There's haven't been much news on this. I bought the 15.6 inch with 16 GB of RAM and the GTX 1050 for drawing, scripting, programming, etc. Its still in the box. You said you got this one and it was going to become your everyday work horse and you were going to update your review. Yet, now you are trying to sell it. So ultimately is it good or not good? I am interested in buying your Yoga 720..what are the specs..screen size/ RAM/ SSD size/ 4K resolution/ Warranty period? You mentioned you pasted something called conductonaut–have no idea what that is or why did you do it? Does it affect the warranty? I am in the NYC area..how do I pay–Paypal? Can I email you directly? Actually, I just ended up giving it to a friend. Conductonaut is a special thermal paste that is made of highly conductive materials, including indium and gallium. It is actually corrosive to aluminum and electrically conductive, so great care must be made when applying it. However, done correctly, it will last a lifetime and lower temperatures more than any other thermal grease. Hey Nicos, I am thinking of getting one for similar usages as you. How are you liking it so far?? 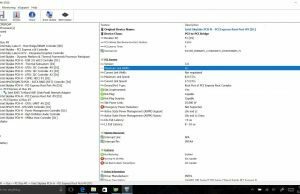 I currently own a yoga 710 with 8 gigs of ram and want to add another 8. Will this one work? "Lenovo 8GB DDR4 2400Mhz SoDIMM Memory"
Will I be able to install it by myself? Thank you! Can anyone tell me how long the battery lasts for on the 4k and FHD versions on low to medium workload like browsing the web, videos etc. would you know the figure for the 4k version? I'm getting roughly 5 hours on the 4K version with about 70% brightness, mixed use of browsing, videos, and light office work. 2 things to note: it does not boost (you can manually boost with throttlestop) and it throttles. Repasting and undervolting should help, but not sure exactly how much, as I haven't tried yet. I'm on the latest update (v1.05), and there is no maximum performance setting, only performance and balanced. I'm already on performance. Hi! 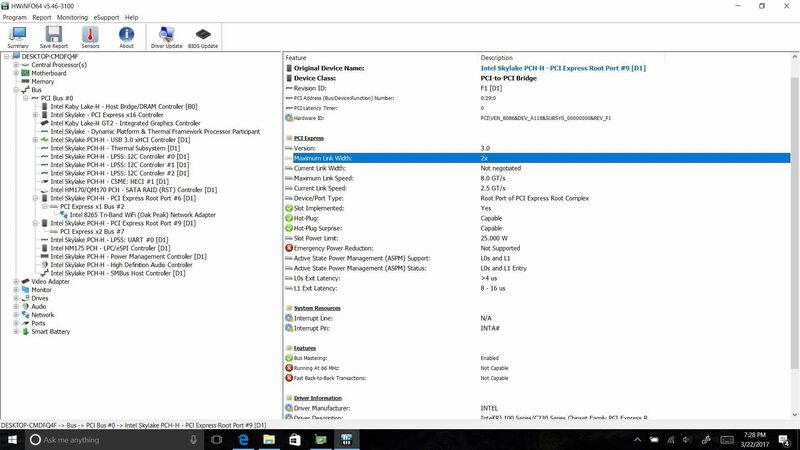 Does this laptop has 1 RAM slot or 2? Thank you! Hello, how may ram slots does this laptop have? I've just bought this laptop but now using it with the Lenovo Active Pen 2, I'm a bit worried the screen might wear off. Is it really required to buy a screen protector since it's a Gorilla Glass screen? 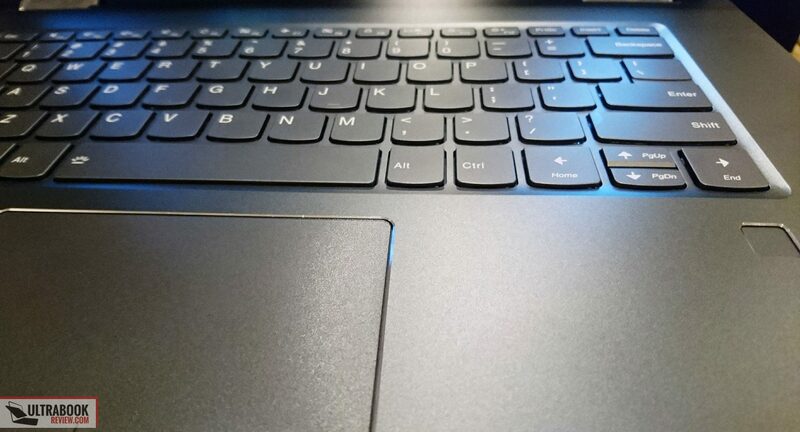 I've seen this forum and people have this issue with the Thinkpad Yoga laptop, although that was in 2015 – forums.lenovo.com/t5/ThinkPad-S-Series-ThinkPad-Yoga/Thinkpad-Yoga-screen-wear-when-using-the-pen/td-p/1781151. Hey Douglas. I've read some of your reviews on notebookcheck too. I am trying to decide between this, the XPS and the Gigabyte. I know you have a Gigabyte and I know Gigabyte has the GTX 1060, but I really can't get past the webcam being under the display. I know with any of the choices, I'd have to undervolt/repaste, that's not my issue. My issue is…which of these would be best for music production? Hey, I'm really interested in the smackdown between aero 15, xps 15 and lenovo yoga 720. Is there any way we could see a comparison between theese three. Is there a big difference between this yoga with 16GB RAM and yoga with 8GB? I mostly study with it and seldom create movies. one more question: Is this computer is better than Asus VivoBook N580VD? 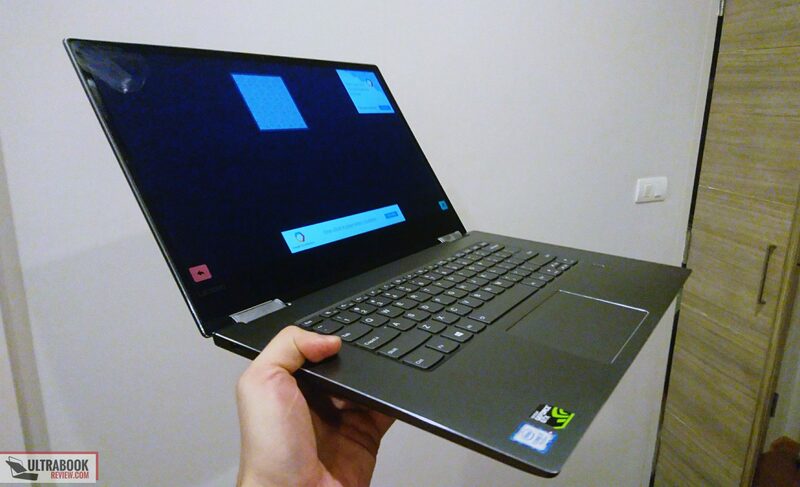 Yeah, I'm also interested in seeing a in-depth comparison between Aero 14/15 vs yoga 720 15 (not so much the xps due to its thermal issues which can't be fixed without opening it, which I find ridiculous that you've to do considering it's price range).. sadly doesn't seem most reviewers keep devices long enough. And most people only seem to have knowledge of only the one device they own and not the other. 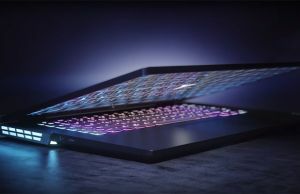 I'm more leaning towards getting a yoga 720 15 tho, as the Aero 15 seems to have be sold with a broken keyboard (again unacceptable at the ~2k price range) and I do not like the keyboard layout of the Aero 14 (has macro keys on left side). But for some odd reason most reviews seem to have a fairly lukewarm reception to the yoga 720 15 which makes me think I'm missing something as I've not personally handled either device in real life. Lastly, I don't really get the whole or big deal regarding pcie lanes thunderbolt 3. For what exactly? eGPU? 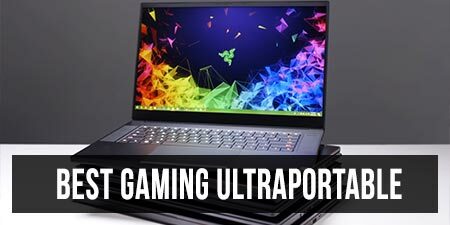 If space is an issue and money is no object (which seems to be the intended audience), wouldn't it just be better renting a multi gpu setup from nvidia grid or aws/gcp or just buying 2 laptops to begin with? The real deal between XPS & Yoga 720 is money & touch screen. I got mine for 969.99 (GTX1050, 8 ram, FHD), a seller from the official site gave me extra 30$ off. Pros: 300$ less (more than 30%, it is a huge difference), touch screen ( it's must have in 2017 ).